I did some research and it might be coilpacks or sparkplugs? Unfortunately I don't have OBD2 reader to see what the check engine code is. Just wanna ask your opinion before I start throwing parts at it. Yep, with these near bulletproof cars, you cannot worry about anything major until the "big 3" are taken care of. Ignition coils, iridium spark plugs and a valve adjustment. It will run you some money but the big 3 are probably responsible for the majority of performance problems with the Jazz/Fit. Good luck sir. Thank you sir, I'll start with checking valves, will replace sparkplugs and report back. Coils will go last, as they are most $$$$$. One of the coils is broken. Couple others are pretty oxidized - so that probably means I should replace all, right? Yes. Changing ignition coils one at a time has proven to be ineffective according to many members of this board. Buying cheap replacements has also proven to be a mistake. Stick with Hitachi or Denso products when dealing with the ignition system. 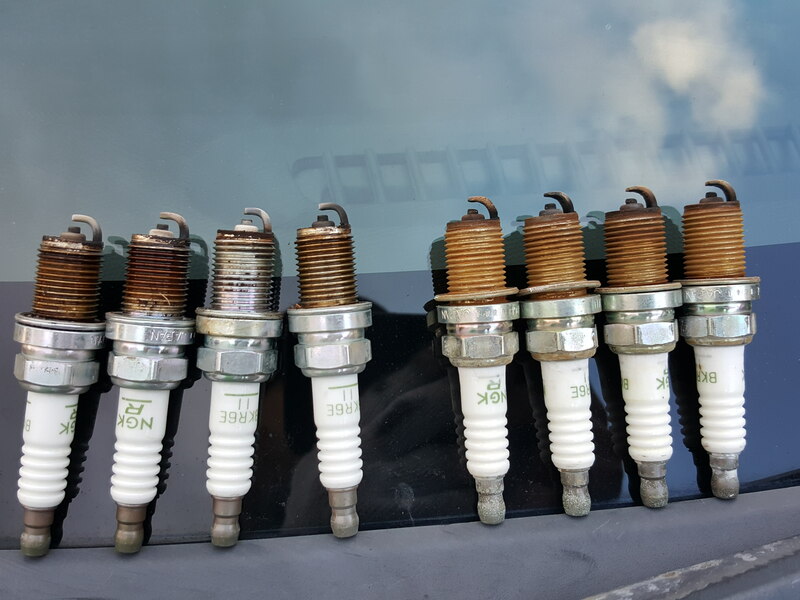 When you take out the individual coils, make sure that the spark plugs are properly torqued. 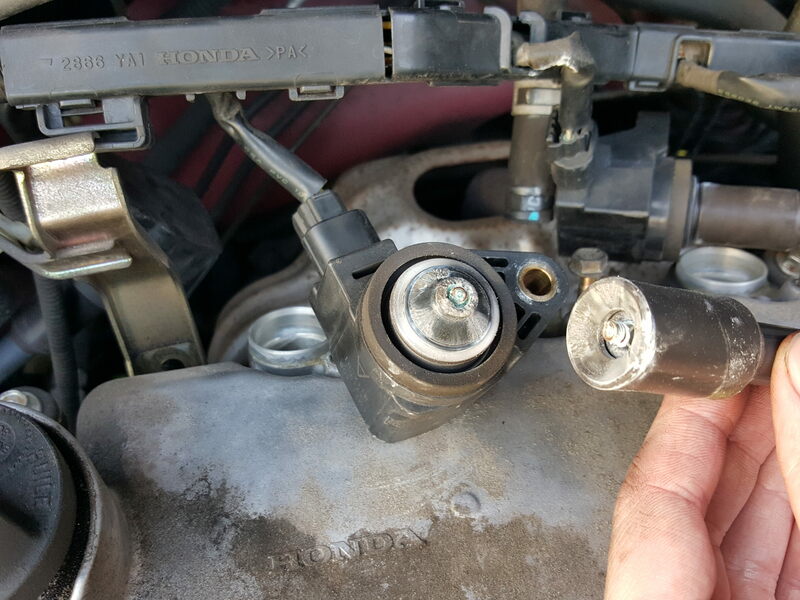 If not torqued properly, gases can emanate around the aluminum gasket and foul the ignition coils. Unfortunately I don't have OBD2 reader to see what the check engine code is. You should do yourself a favor and go buy one. Ultragauge, scangauge, Torque(+bluetooth), OBDLink (+bluetooth/"wifi"). etc... there are a lot of options and most are inexpensive. OBD scanner is on the wishlist. Thank you, BurntZ and Goobers for help! Last edited by SAPD; 03-30-2018 at 06:15 PM. 1. Adjusted the valves - all of them were a bit too loose, but not by much, usually 0.02mm over spec. So I set them in the middle of factory specifications. 2. Changed the spark plugs - when I took out the front spark plugs, they actually didn't look too bad. But the rear ones were a different story: https://i.imgur.com/4Z2D6xW.jpg . I think what happened is some absolute legend changed only the front ones, and the rear ones are original from the factory. So if the car somewhat ran with all this, I'm hoping it will be a rocket when it's fixed. 3. Checked out the engine mount - here's pictures: https://imgur.com/a/nwb5s . What do you think? Is it too loose? 4. Another can of worms on this car is the suspension - how about this top strut mount? Is it supposed to be loose and squeaky like this? I had pretty much the same problem, 195,000 km. I replaced one coil that had visible damage but the problem remained. looking at the old coil unit I noticed the coil boot was pretty much fried so I replaced the coil boots on the other 3 and it totally disappeared. I felt in heaven driving!!! Most places don't sell coil boots though, I got a set of 4 from china thru aliexpress for $16, took about 2 weeks for delivery. Cheap chinese coils also available for around $60-70 set of 4. Sounds bad doesn't it "cheap chinese coils", but I think most items are made in china anyway nowadays. Good advice above to do the timing, that'll go a long way helping remove the problem. ah, sorry, didn't see that you had already ordered coils! Wow at the loose strut! ooh, I had no idea you can replace just the coil boots! I might try it on my friend's Fit that's doing the same thing. Thanks blood dog. Also, I've been told the loose top strut mount is a feature, not bug. Hey guys, so it's fixed! Thanks everyone for help! Just did a short test drive and all seems to be working. I'll update how are they holding up after some more driving. Btw, the coils I got from Aliexpress look identical to the original ones and have Hitachi stamped on them. Are they still fake or do they actually sell genuine parts on Aliexpress? 4. Another can of worms on this car is the suspension - how about this top strut mount? Is it supposed to be loose and squeaky like this? https://www.youtube.com/watch?v=Jo-10_QPcHg Can somethign be done? Let me answer this as I understand it. In older cars (1979 Supra, 1987 Camry etc) the upper front strut rod end is passing through the bearing in the upper strut mount; the outer diameter of the bearing is held stationary relative to the car's body. So when front wheel turns, the entire strut housing and its center rod were tuning as a one piece. Contrary to that, on Fit only the strut housing is rotating relative to the strut rod (the bearing is placed between upper spring seat and center strut rod) The rod is held stationary relative to the body. The upper and lower cushions are used to dampen noise and vibration (like on rear struts) and allow some tilt of the strut relative to the body during turns. If on your car the upper cushion moves with car on the ground the bearing is stuck; if it moves when car is on the lift the upper cushion is worn. Makes sense! Thanks doctor J! Last edited by SAPD; 04-15-2018 at 08:41 PM. A set of coils on ebay are $25.00 for a set of 4 shipped to you in the USA. I used those along with a new set of NGK sparkplugs and it fixed me right up. No need to get pricey Hitachi coils. Hesitating again after coils & plugs?